Tuesday in Yuma . . .
Jan and I headed out about 2:30 this afternoon to solicit more door prizes for the upcoming Gypsy Journal Rally here in Yuma. We continued to work our way down the list, picking up several more door prizes, and getting a few ‘Come back tomorrows”, about par for the course. Our daughter Brandi called about 3:30 to catch us up on Landon’s latest antics. Hopefully we’ll be able to Skype soon since we really miss the little guy. About 4 Jan and I headed back toward the rig, but first stopping off at the Wal-Mart right outside the fairgrounds to pick up some supplies. We’ll probably have to go again before the Rally starts since we won’t have time during the rally. Getting home a little before 5, Jan got the groceries put away, just in time for Nick to call about dinner. We decided on Texas Roadhouse, so about 5:30 the Gang of Six, along with the addition of Bob Parker and Donna Huffer, headed over there for a great meal of grilled bovine flesh. Sounds real tasty, doesn’t it. While we were there, we got to thank the manager for his donation of several gift certificates to the rally. We try to only eat at places that help us out, and it always helps when they have really good food. On another note, I finally got a chance to take a look at some of the numbers for our trip here from the Texas. Our best MPG was the 138 mile trip from Tucson to Gila Bend. Our Silverleaf showed 11.2 MPG. This was probably helped by the fact that during the trip we dropped from about 2500 feet down to about 700 feet along the way. It always nice when gravity lends a hand. Our 116 mile trip from Gila Bend to Yuma gave us about 9.5 MPG, still not bad. And our overall MPG from Houston to Yuma was about 8.9 MPG. Pretty good for moving 37,000 pounds down highway at 55 MPH. It was really nice to be able to just get up and relax this morning without having to pack up and travel somewhere. But after goofing off all morning we did have chores, Gypsy Journal Rally chores, for Nick. So about 1 pm Jan and I headed out to start soliciting gift certificates to give away as door prizes at the nightly get-togethers. But our first stop was the Der Wienerschnitzel right across the street from the fairgrounds. Jan and I both really enjoy a good hot dog, and Der Wienerschnitzel always fills the bill. Even their Cheddar Poppers are hot and spicy. After lunch, we began working our way down the list of last year’s donors. After a slow start, we got donations from Applebee’s, Texas Roadhouse, Famous Dave’s BBQ, and Mimi’s, and several requests to come back tomorrow to pick gifts up. We got back to the rig a little after 4:30, and a little later, Mister and I sat outside for a while. I was watching the Marine AV-8A Harriers doing T&G’s, while Mister was on coyote patrol. As we were parking here yesterday, Nick said he saw a coyote run thru the grassy area behind us, and then later we heard about a coyote attacking a small dog belonging to a gun show attendee here at the fairgrounds. A little after 5 pm, Nick, Terry, Tom, Barb, Jan and I headed over to downtown Yuma to have dinner at Da Boyz Pizza, One of our favorite local restaurants, their pizza, and everything else for that matter, is fantastic. Jan had her favorite Meat Ravioli and I had their Spaghetti and Meatballs. We also got a small Pepperoni, Sausage, and Mushroom Pizza so we would have plenty of leftovers. The manager remembered us from last year, and gave us a very nice door prize donation. Or maybe it was just a way to get Nick and I out of the place. On another note, I found out that mounting the 12 volt satellite power plug in the outside bay has another advantage besides convenience. Since I can now keep power on the satellite all the time, this means that if the antenna is moved or jostled from any reason, like this evening’s high winds, the antenna instantly realigns itself and doesn’t lose the signal. You notice how accidents always seem to happen with unloaded guns. This is the reason I always keep my guns loaded. If it’s Sunday, it must be Yuma . . . Since we didn’t have far to go this morning, only a 116 mile trip to Yuma. we slept in until about 8 before getting ready to travel. We pulled out of our site at Holt’s Shell RV Park about 10 am and traveled right across the parking lot to have a breakfast sandwich at the Subway. Then it was on the road to Yuma. And after a pretty uneventful trip we pulled into the Yuma County Fairgrounds about 12:45 and got set up behind Nick and Terry at our usual spot at the horse barns. After finishing setting up, Jan and I read and interneted the rest of the afternoon, until about 5 pm, when Tom and Barb Westerfield, Nick and Terry, and Jan and I headed over to Famous Dave’s BBQ for dinner. And, as usual, when we all get together, we spent more time talking than eating, and didn’t leave until after 7. It’s good to be back together with good friends. Life is all about your choices. Make good ones. Project Day in Gila Bend . . . 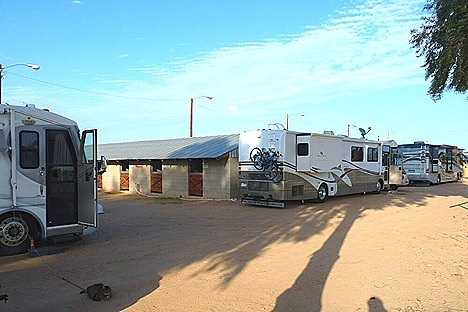 The RV Park here in Gila Bend is one of my favorite places for getting projects done. They have a good hardware store, a good auto parts store, and not a lot of distractions. After our morning coffee, my first project was to remove the door trim panel on our truck. When I replaced the power window system a month or so ago, I had problems getting the manual door lock working correctly, and the result was that when you locked the doors, the three passengers locked, and the alarm set, but the driver’s door didn’t actually lock because of the drag of the manual locks. Luckily it only took about 20 minutes to remove the panel, adjust the lock, and replace the trim panel. Now it all works fine. 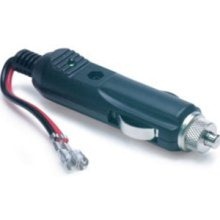 Next up I wanted to mount an external 12 volt socket in one of my outside bays to supply power for my Winegard Carryout Automatic Satellite Antenna. 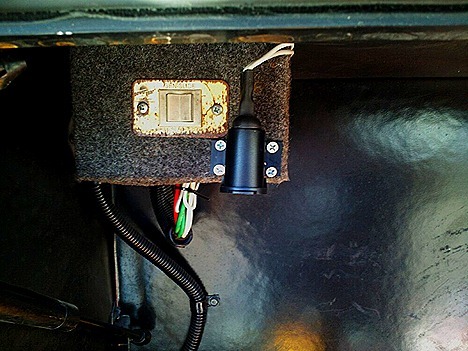 It only requires the 12 volts during the initial setup, and right now I just bring the cable inside the coach and plug it in on the dash. But I wanted to install a more convenient socket. 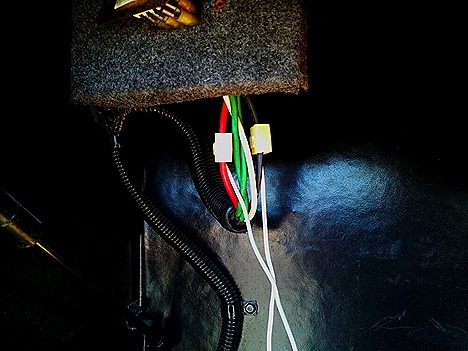 I figured I would see if I could find a source of 12 volts in the storage bay directly under my driver’s seat where the satellite wires are also attached. So I pulled the generator slide IN/OUT switch out of its housing and found the 12 volts I needed on the switch. but I didn’t have any that would handle the 12 gauge wires on the switch, so a trip into Gila Bend to the NAPA store was in order. Since it was about lunch time, I checked with Jan in the laundry room next door to see what she wanted to do. She was doing our heavy rugs in the big machines that she doesn’t like to do in our coach washer. We decided that I would just bring something back from the Subway across the parking lot from the park. 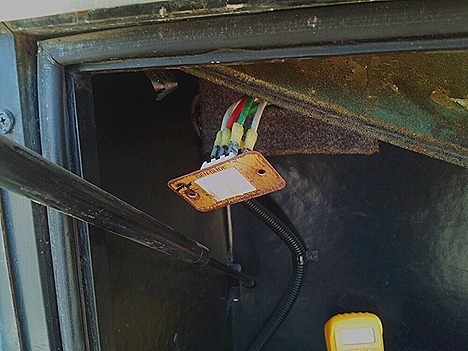 and then mounted the socket to the IN/OUT switch panel. After checking the voltage to the socket, I declared the job done and got out of the sun. It was over 80 degrees here today, and the bay where I was working was right in the sun. At this point I thought a nap was in order, and it was. Around 6 pm, Jan and I drove back into town to have dinner once again at Sofia’s Mexican Food. 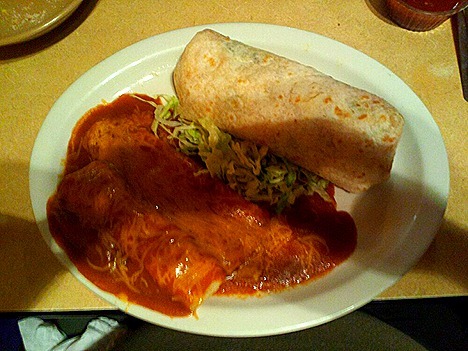 This time I decided to try Jan’s favorite Shrimp Burrito, but in my case I added a couple of their delicious enchiladas. It was as good as Jan had said. After a great last meal here in Gila Bend, we headed home for the night. Yuma, beware. Nick and I are teaming up again. Our society chooses to pay for illegitimate children and wonders why the number of them increases. Our society refuses to support poor families with married fathers in residence, and wonders why the number of single mothers increases. Our society pays for single motherhood, and wonders why we get it. Our society gives stipends to unemployed and/or homeless males, and wonders why we get more and more of them. I was up about 6:30 this morning, for two reasons. 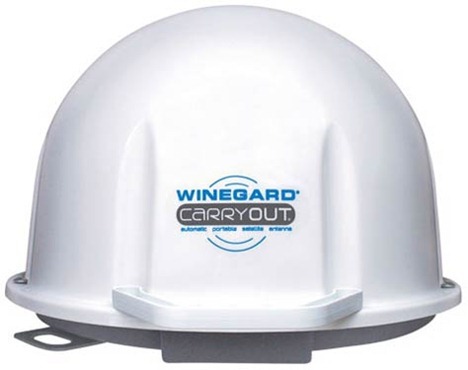 One, it was a travel day and I wanted to start packing things away, and two, I wanted to call Winegard about the problem with my Carryout Satellite Antenna. Their hours started at 7:30 CST so they would be open now. So after starting the coffee, I got on the phone with a young lady at Winegard who gave me a couple of more things to check on and then call her back after we get to Gila Bend this afternoon. We pulled out of the Pima County Fairgrounds a little before 9:30 heading for Gila Bend about 135 miles away. We’re going to spend two days there before heading over to Yuma to meet up with Nick and Terry Russell to start getting ready for the upcoming Gypsy Journal Rally starting March 4th. We pulled into Holt’s Shell RV Park a little before noon, found an empty site, and got parked. Then I walked over to the office and paid for two nights. We got here this early in the day because this time last year we had to wait for RV’s to pull out before we could get a site, but this we had plenty of sites to choose from. After getting hooked up, I took the dome off the satellite antenna and started checking for 12 volts on the circuit board. And came up with zip . . . no 12v. So I started working my way back up the circuit, finally getting back to the power cable itself. So I checked it again. And this time found no voltage on the cable. Huh? I had voltage on it last night. What happen? Well, as it turned out, I apparently managed to hold the cable in the one position where it worked. A little experimentation showed that the problem was in the plug itself. This was good since I would be able to replace this myself. But in the meantime I called Winegard to see about getting a replacement cable. I was told I would have to fax them my sales receipt and they would send me a new cable, no charge. 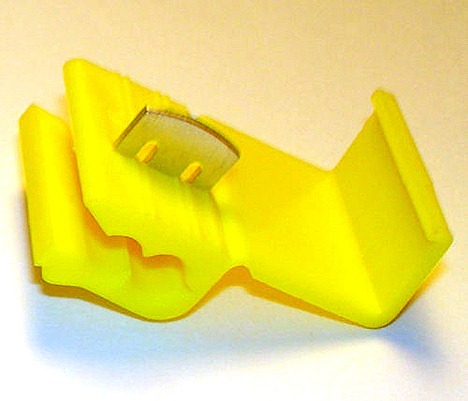 Since I didn’t want to wait that long, I drove into town and bought a new plug at the NAPA Auto Parts store. Getting back to the park, I had the plug replaced and the antenna up and working in about 20 minutes. Great! Now I’ll get to watch “Fringe” tonight. Later, about 5:30 Jan and I headed into town to have dinner at Sofia’s Mexican Food. 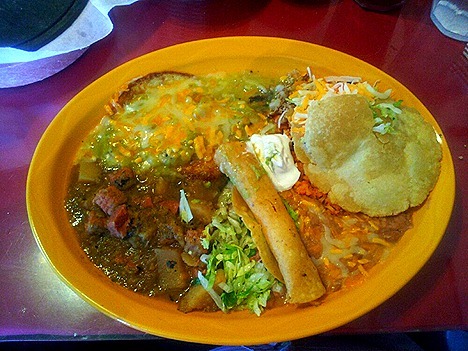 A little hole-in-the-wall place, it has some of the best Mexican food around. We always eat here, and in fact, we’ll eat here again tomorrow night. 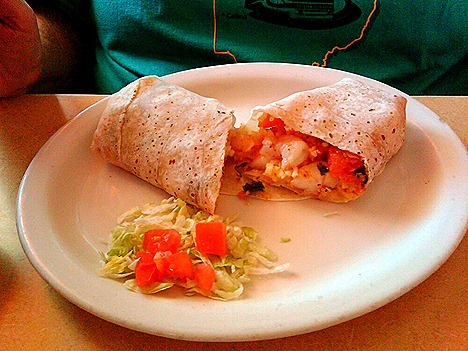 Jan loves their Shrimp Burrito. It’s jam-packed with large, tasty shrimp, and is a meal all by itself, although Jan usually gets an order of guacamole with it. 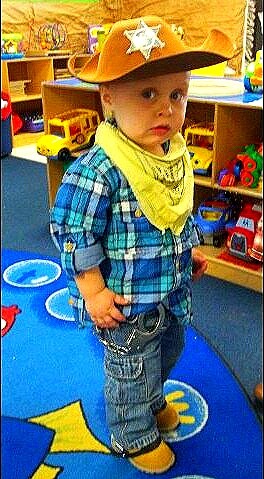 Back in Houston, it’s Go Texan Day, and everyone dresses up Western, even Landon. 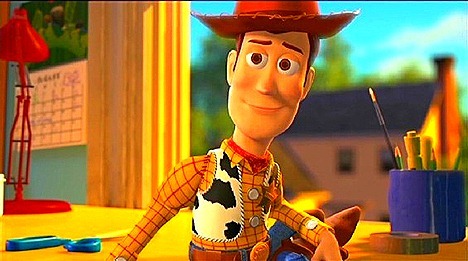 I think he looks like Woody, the cowboy in the Toy Story movies. 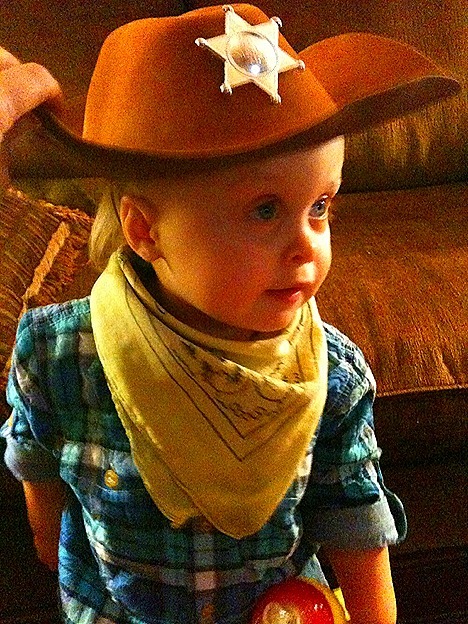 Brandi said when she put the hat on him, he didn’t like it, until he saw himself in the mirror with it on. Then he didn’t want to take it off. Mater tua caligas gerit – A closed mouth gathers no feet. We pulled out of our site at the Coachlight RV Park about 9:15 this morning, heading for Tucson, about 250 miles away. But our first stop was a Valero station about a mile and a half up the road. I had done some checking on GasBuddy and found diesel just got more expensive the further west we went, so I took on a little over 100 gallons at 3.839 a gallon. The only problem was how slow the pump was, but we were back on the road by a little before 10, and on our way. As we got to the top of the hill (Las Cruces sits in a valley several hundred feet below the Interstate) we started getting hit by a lot of wind. Not enough to cause the dust storms all the signs were warning us about, but it did make things interesting for a while. Two hours later, coming into Lordsburg, we stopped for lunch at Kranberry’s Restaurant, where we’ve eaten several times before. The food is good, but even better they have a large parking lot that can handle RV’s with no problem. After soup and sandwiches, we walked across the street to the Valero station and got us cappuccinos for the road. They had a new flavor, Mocha Cinnamon that was really good. As far as the soup goes, I’m always amused at what some places called Chicken Tortilla Soup. 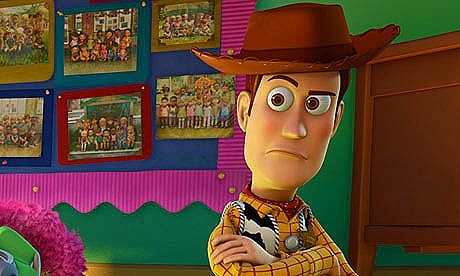 Although what I had was good, it wasn’t Chicken Tortilla Soup. Besides chicken, it had corn, carrots, celery and green beans. It also had some tortilla strips sprinkled on top, kind of as an afterthought. I figure tomorrow they’ll just leave off the tortilla strips and it will be on the menu as Chicken Vegetable Soup. We got into the Pima County Fairgrounds a little before 4 pm, and found the place pretty full of RV’s. Don’t know what’s going on, but we ended up in the same site we were last year. After getting set up and goofing off for a while, we headed over to Poco & Mom’s to meet our friends Al and Adrienne for dinner. 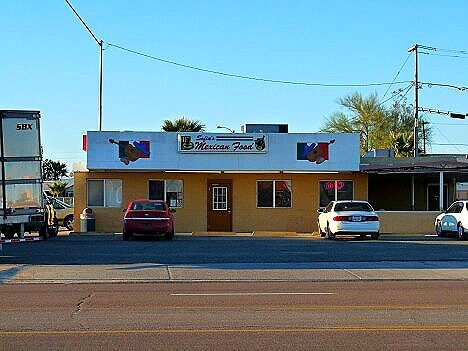 They introduced us to this place a couple of years ago and we always eat here at least once when we’re in Tucson. They really work some magic with the Hatch Green Chilies, very hot and spicy, and they make a great Chile Relleno too. We’ve known Al and Adrienne since we met in Fairbanks, AK in 2008, and we try to get together whenever we can. We visited them this past summer when they were workamping in Cody, WY, and before that, in Westport, WA in 2010. We headed home about 7:30 after saying our goodbyes. We’ll get to see them again next week at Nick Russell’s Gypsy Journal Rally in Yuma. Now for the Bummer! part. I think my Winegard Carryout Satellite Antenna may have died. It’s been working flawlessly since I bought it last July, but the last couple of days it seemed to be taking longer and longer to find the satellite. Then this afternoon it wouldn’t find it at all. In fact it’s not even trying to find it. Normally after you plug it in, you can hear the motor inside running as it lines up on the satellite. But now, nothing. I check the power cord and it’s got 12.8 volts coming out so it’s OK. I guess I’ll call Winegard tomorrow and see what they say. A Real Head Sweater . . .
After a nice, quiet morning of coffee and some of the delicious muffins that Jan and Gina baked last week, we headed out about 1 pm for an afternoon of errands and dinner. Our first stop was the Sam’s Club pharmacy to pick up a new prescription for Jan. Her doctor had changed one of hers and sent it into the Sam’s near our house in Friendswood. Unfortunately they went ahead and filled it and called to say it was waiting for her . . . in Friendswood. So I called the Friendswood Sam’s and had them unfill the prescription so it would show back up in the system, and then called the Las Cruces Sam’s and had it filled here. Leaving Sam’s we called our friend’s Al & Adrienne in Tucson to let them know we’ll be there tomorrow night and set up a time to meet at Poco & Mom’s for dinner. Then, because it had been more than 4 days, Jan was starting to suffer from Wal-Mart withdrawal, so that was our next stop. Hopefully she can hold out again until we’re in Yuma this coming Sunday. Next up was a stop at Supercuts so Jan could get her hair cut. Then it was back to the rig to drop off our groceries and take it easy for a while. Leaving the rig about 4 pm, we first drove over to a nearby Valero to check on fueling up with diesel tomorrow morning as we’re on our way to Tucson. In the past, we’ve fueled up at the Bowlin’s Akela Flats store where we always stop on our way west, but I called this morning to check their diesel price since it didn’t show up in GasBuddy. And I’m glad I did. Their diesel is $4.099, but I can get here in Las Cruces for about 3.839. Big difference when I’m taking on about 100 gallons. Looks like I’ll have no problem getting in and out of the Valero and then we’ll hook up the toad at a vacant lot right down the block. Next up was dinner at El Comedor, our other favorite restaurant here in Las Cruces, besides La Posta. One of the things we both like about New Mexico Mex is their use of Green Chiles in their dishes, and El Comedor does it up right. Really hot, and really flavorful. In fact we both agreed that we enjoyed our meal here tonight better than at La Posta last night. It just had more favor. And their salsa is really hot, hot enough that, along with their green chile sauce, really makes my bald head sweat. And my nose run. My indicators of a really good meal. And the Tres Leches we split for dessert was really good, too. On another note, my oil leak appears to be gone. I noticed I had a leak just after we got back to Houston in November, but since it seemed to be dripping down from the vicinity of the oil filter, I was hoping it was filter-related. When the guy from RV Mobile Lube changed the filter out last month, he said it was wet around the filter, but he didn’t see any problem with the the seal, or the filter itself. So I decided to cross my fingers and wait and see. So far I’ve checked every time we’ve parked , and no leak. But still keeping my fingers crossed. Tomorrow we’ve got about 250 miles to Tucson for one night, hopefully staying at the Pima County Fairgrounds where we stayed last year.